Purple seems a state of grace. Cloaked in it, the world around you bleeds with creativity and honor. A smile isn’t just a smile, it’s a perspective. I see myself as someone I am. A struggle becomes a path, an enemy, a friend. My goal has always been to remain within purple. But, over the last few years, it’s become very clear to me that red must intrude, must kick purple to the curb and salute a raw instinct to fight. Mothers know this. They may not feel purple, perhaps they walk with blue or yellow. But, in a swift second, they fill with red when their children are threatened, teased, or hurt. I know. I’m a mother and a teacher. The inconsistencies shock some and are vulgar to others. I’ve been yelled at by many mothers, and I’ve done a lot of yelling myself. However gentle I try to be, especially with teachers, my manners disintegrate when confronted with problems affecting my children. Knowing this has changed me even more so when dealing with parents. My purple turns to deep red for the mothers who yell at me. I usually sympathize more than they know. The angrier the mom, the more I can take a good beating from her, even if she’s completely wrong. The last mother who yelled at me never should have. She was wrong, but I didn’t get mad. I looked her in the eyes and told her to understand that when I spoke to her, I wanted to help her. It didn’t take much. I didn’t even have to tell her I had children too. She simply saw it in my eyes. By seeing red, by understanding it, I can live in red more comfortably now. I know what it’s there for. It’s a call to action, a desire to protect, a need to be heard. Red is love, pure, passionate love. Bravo, Lisa. And thank you for such inspiration and courage in your sharing. Thank you for the sincere compliment. I really appreciate writers giving me this kind of feedback. You’re right. Before I had children, I felt the power of red, but I feared it instead of embracing it. Now, I value it. I know. In the process of writing this I fully realized its beauty. And if I can add, strength to that roll. In some cultures babies are swaddled in red to ward off negativity & evil. Red is beautiful ! Thank you for adding. I didn’t know that, but it makes sense and shows wisdom. I’m going to search for those cultures so I can learn more about it. 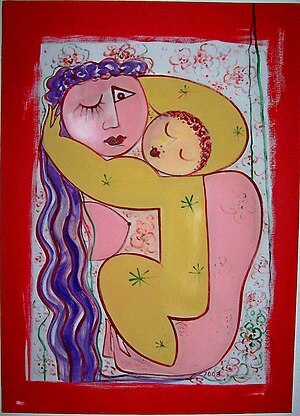 Good article – and great find with the Mother with child image by Emilia Bayer. I had to find out more. I hope I can draw like that at age 74! Yes, I was searching for an image and there it was. I had to use it. You have described this journey so well, I completely related. I too understand red. I simply HAD to do a red painting at one point in my life – it was such a strong need. The red reflected me. At that point I also NEEDED to wear the opposite colour to the red that I craved – turquoise (green/blue). The turquoise comforted me.